Anybody who lives in and around the Whitmore Lake region and who is looking to rent a party bus for any reason, can stop their search immediately. Here at Rockstarz Limousine and Party Bus, we focus on providing our clients with the most amazing time whenever they are with us, and whatever the reason for the celebration may be. When hiring a party bus in Whitmore Lake, you will probably be concerned about the space that is available in order to know how many individuals you can have with you. However, we have sought to get the maximum amount of space in our party bus allowing you to bring even more people with you making sure that everyone does indeed have a great time. 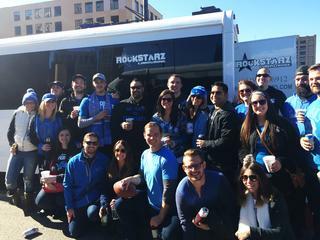 Furthermore, our Whitmore Lake party bus rental service is designed to provide you with a special kind of atmosphere in our party bus as you cruise around town. From the plush leather seats, to the booming sound system incorporated with a laser light show that will stun you, this is going to feel like your own private nightclub on wheels. In the past, individuals have looked at using our Whitmore Lake party bus service to celebrate so many different types of occasions. No matter if it is a birthday celebration, a special anniversary, or perhaps you just want to get a number of friends along with you and just have a special evening for no particular reason, we can cope with it all. So, if you do indeed reside in the Whitmore Lake area and feel like a party bus is going to be the perfect solution for you, then give us a call here at Rockstarz Limousine and Party Bus. Alternatively, you can contact us via our website and a member of our team will then be in touch as soon as possible.